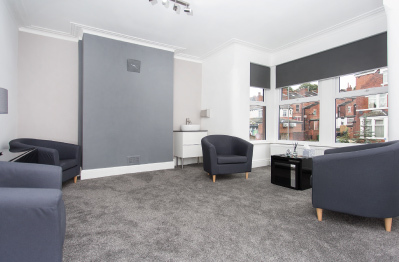 We have 5 fully equipped, modern therapy treatment rooms available for hire in an established clinic just 5 minutes from Leeds City Centre. The rooms vary in size, but are all quite large. All the rooms have high ceilings and large windows, letting in lots of natural light. The entire centre has recently been refurbished, enabling a modern, clean and inviting feel to the centre. 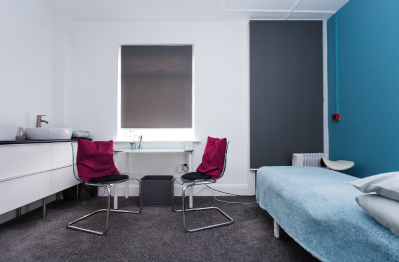 All of our rooms are suitable for talking therapies. Two of our rooms have treatment tables and sinks. One of our rooms is larger than the others, with stackable study chairs ideal for workshops, group sessions, training, yoga or pilates. We have a separate clinical room for weighing and measuring individuals. There is an intercom system in each room to allow clients entry to the centre and the waiting room, controlled by the practitioners from their room. 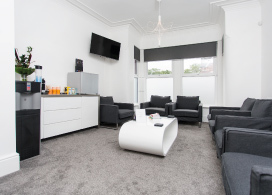 The waiting room is stunning, with chilled filtered water or hot water, complimentary tea and coffee, complimentary WIFI, TV, magazines, books, mindful colouring, a toilet and comfortable individual sofa chairs. We have a fully integrated online booking system that enables a practitioner to book any room at any time on a regular or ad hoc basis. 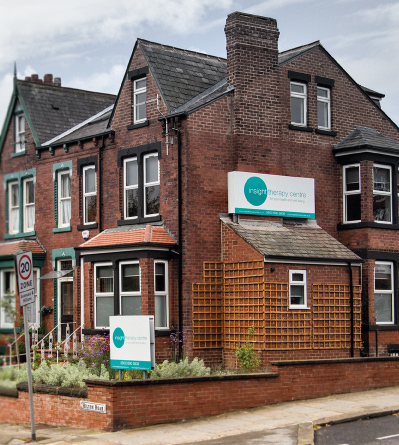 To join our team of practitioners you would need to have the relevant qualifications for the therapy you intend to provide in the room as well as current professional indemnity insurance. We have package discounts available. Large therapy room (4.74 x 4.5m) fully equipped with desk, 4 easy chairs, tissues and a clock. This room is located on the ground floor and is accessible in a wheelchair. It has a bay window allowing lots of natural light, and a high ceiling. 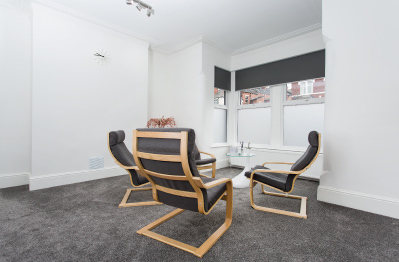 The room is suitable for counselling, therapy, family work, dietetics and consultations. Large therapy room (5.2 x 4.4m) fully equipped with desk, 4-5 easy chairs, tissues and a clock. This room is located on the first floor. It has large windows allowing lots of natural light. It also has a sink and a treatment table. The room is suitable for body therapies, counselling, therapy, family work, dietetics and consultations. Good sized treatment room (4 x 3.2m) fully equipped with treatment table, desk, 2-3 hard backed chairs for consultation, tissues and a clock. This room is located on the ground floor and is accessible in a wheelchair. It has 2 windows allowing lots of natural light. 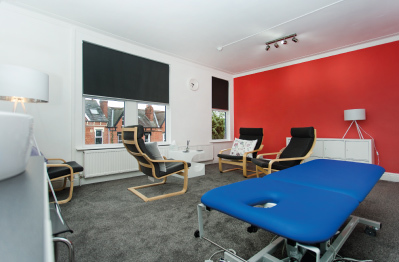 The room is suitable for body therapies, counselling and dietetics. Good sized group room (8.5 x 5m) fully equipped with 16 stackable study chairs with folding desks and a clock. This room is located on the second floor. It has a number of windows allowing lots of natural light. It has wood flooring. 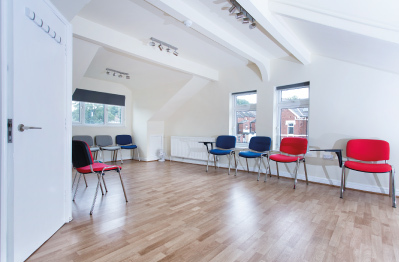 The room is suitable for workshops, group work, training, family therapy, yoga, pilates or talking therapies. Large therapy room (5 x 4.6m) fully equipped with desk, 4 armchairs, tissues and a clock. This room is located on the first floor. It has a bay window allowing lots of natural light, and a high ceiling. 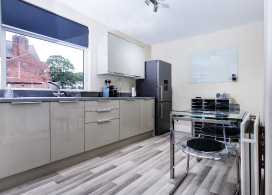 Modern kitchen with fridge, freezer, chilled water, complimentary tea and coffee, kettle, microwave, table and chairs, notice board and practitioners own post tray. This room is modern and comfortable, with chilled filtered water or hot water, complimentary tea and coffee, complimentary WIFI, TV, magazines, books, mindful colouring, a toilet and comfortable individual sofa chairs. 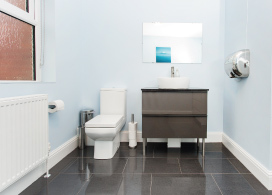 We have a toilet located in the waiting room on the ground floor and a bathroom on the first floor. You may rearrange or cancel your session up to 24 hours before your appointment. Cancellations within 24 hours of your appointment will not be refunded.